A few weeks ago, I found myself exploring one of the most beautiful secret destinations in Australia - Kangaroo Island. Situated off the mainland of South Australia and southwest of Adelaide, Kangaroo Island is home to 4,000 people, as well as Flinders Chase National Park, an abundance of wildlife, and the most amazing lodge I’ve ever stayed at…Southern Ocean Lodge. If remote luxury wilderness is what you’re looking for on your next vacation in Australia, Southern Ocean Lodge has it alllllllll. Floating atop a secluded cliff on a rugged stretch of private coast, the lodge commands panoramic views at every vantage point - both the wild Southern Ocean and the pristine Kangaroo Island wilderness. So don’t be surprised if you see a kangaroo hop past your room every morning. But first, here are a few important facts about the island. Covering almost 4,500 square kilometres, Kangaroo Island is Australia’s third largest island and one third is declared as Conservation or National Park. Home to the sculpted Remarkable Rocks and stalactite covered Admirals Arch, you’re sure to come across koalas, kangaroos, Australian sea lions, penguins, echidnas, New Zealand fur seals and a whole lot more on your travels around the island. With the constant stunning coastal vistas, unspoiled landscapes, rocky headlands and deserted stretches of white sand, there is so much to be discovered. And let’s not forget the foodie scene - fresh seafood and local produce make a feast for the senses - it’s oh so Australian. 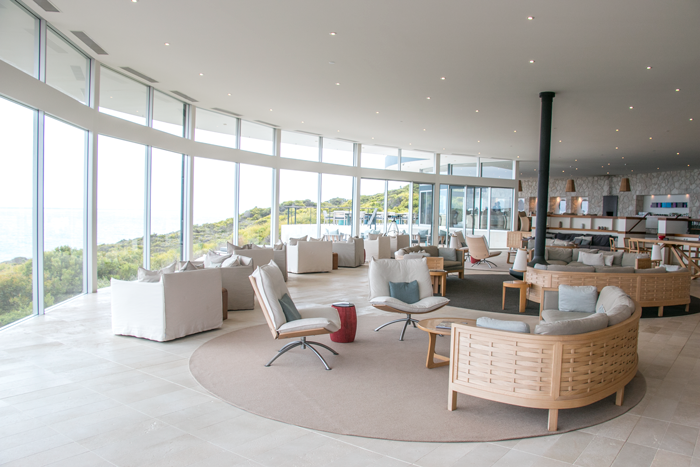 Now let’s talk about Southern Ocean Lodge. First up, it consists of 21 luxuriously mesmerising lodges with views stretching along the coast, creating a seamless transition from creature comforts to breathtaking wilderness - exactly what I look for in accommodation. I could tell you about the extravagant beds, sunken lounges, floor to ceiling glass windows, timber bathtub, outdoor terrace and spa, as well as the walk in wardrobe and double shower, but I’ll let my photos do it more justice. Staying at the lodge is for the traveller who is happy to spend a little extra on luxury, but it’s so worth it. The lodge offers a complimentary room bar (with cheese, wines and more) but also all food and beverages are included in your stay. Yup, you read correctly. Every meal - breakfast, morning tea, lunch, afternoon tea, early evening canapes and dinner is included. And alcohol too! So don’t expect to take your wallet out of your bag for the duration of your stay. In fact, expect beyond exceptional fare here - the chefs take the ‘paddock to plate’ concept literally and the menu changes daily. With only 21 lodges, your chances of seeing other guests are pretty slim! Walking to the beach from our lodge, with a beer in hand of course!